The Indian automotive industry is showing some signs of recovery, the last couple of months has sales graphs climbing steadily north. Make no mistake however, this is not a blanket growth. Not every manufacturer is showing a come-back to form, the buoyancy is coming in from a handful of models that are dominating sales charts dramatically enough to give overall numbers a get-well-soon glow. 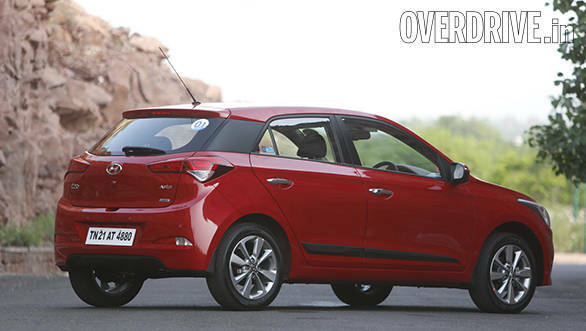 One such car in particular that will make a difference in the next few months is the new Hyundai i20. There I've almost said it, the Hyundai i20 will be a gleaming success. And that is what I will struggle with for the next few paragraphs. There is a debate raging inside me, on one hand my head says and that's usually the place we go to whenever money comes into question, the new i20 is brilliant. On the other hand, my heart is feeling a bit disappointed because it was looking for something more from the i20. But let me not be vague and instead start from the beginning. 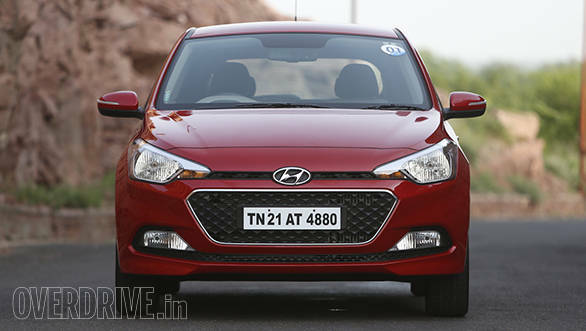 There is no arguing with the fact that the new i20 is by far the handsomest car in the hatchback segment. I cannot explain but where design is concerned Hyundai have gone straight to the top of the game, there isn't any car in either the hatchback or the sedan segment that looks as good or better. To me there are three visual standout areas in this Fluidic Design Language version 2.0 - why do they call it that, because there is nothing fluidic about this design language. It's a hard hitting, edgy design language which you just cannot ignore. This is Angelina Jolie in her hot Tomb Raider outfit guns, grenades et all; not Anne Hathaway's Devil Wears Prada pencil skirts and stilettos. I think they should have called this the 'Eye of the Storm' design language or something similar, a throwback to the Storm Edge design language we saw recently on the new Santa Fe. 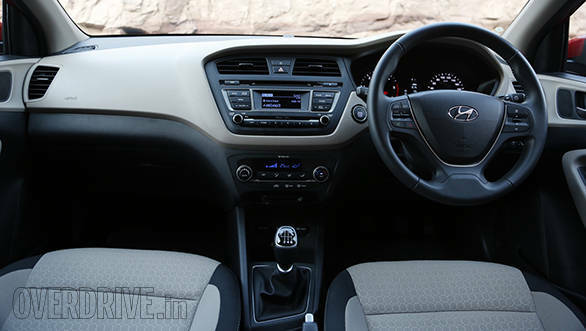 Pulling myself away from the visions in my head and coming back to those three visually stunning areas in the i20. The first is the combination of that sensational chrome edged honeycomb grille and the lower bumper which has the driving lamps connected by a slim black plastic mesh grille. It simply looks superb. I also like the way it gives the front end a tapered effect, as if the entire nose end is coming together at a point. On a secondary note, I also loved the headlamps which if you look closely no longer have a fluidic boundary, but a hard edgy design with seven definite corners to them. Count the kinks and you'll see what I'm referring to. The second area that got my attention and I'm sure will catch yours too is the floating roof effect thanks to that blacked out chunky C-pillar. It's a superb move to enhance this car's sense of dynamism. Mated with those narrow window areas, the i20 looks like it wants to be athletic, aggressive and always surging across the finish tape with its nose craned forward. The third area that will catch your attention is the tail lamps, which did remind me of something Alfa Romeo and Audi have done to their cars. It's very similar in form, yet good looking enough to stamp its identity clearly. Now there are other design highlights as well such as that sculpted hood, the slim plastic cladding on the doors, the sloping roof, the chiseled wheel arches all of which complement the overall look of this car. 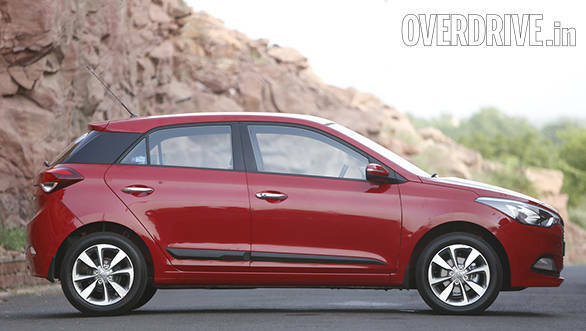 My only grouse with the exterior design is the massive wheel wells which were designed to house 18-inch wheels and low profile tyres and look a bit empty with the 16-inch alloys and Bridgestone tyres (see our separate story on the India-spec i20 vs the European spec i20). Now I haven't seen how the base versions of the i20 appears with the 14-inch wheels and tyres but I'm sure it will look inadequate. In the future, I'd also like to see Hyundai offer this car in India with the LED driving lamps and projector headlamps as well as a better place to house the reversing camera rather than the pimple like bulge on the rear hatch just below the Hyundai badging. 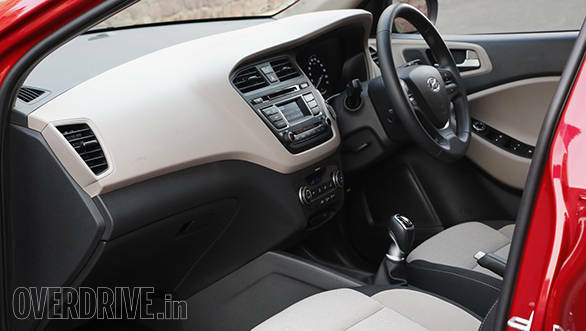 Coming to the interiors, the new i20 easily possesses the best looking interior among them all. Not even the Volkswagen Polo, which I feel is a classy interior job indeed, can hold a candle to the sheer presence of the i20 interiors. It is impressive enough to be counted among the more luxurious German set of premium hatchbacks. 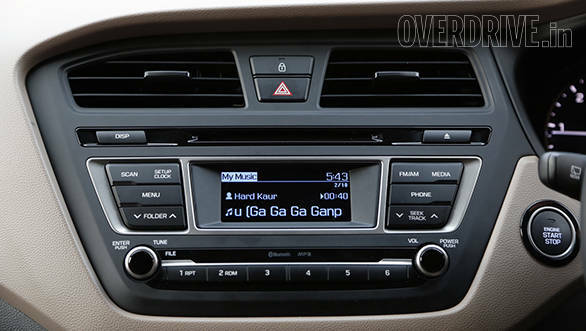 Starting off at the dashboard, the basic idea Hyundai have captured is to try and make this look like a wrap-around dashboard with some of the elements inclined towards the driver. It's similar in form to what BMW offers in their cars and I dare say some of the elements even look like they came straight off a BMW. Again there are no mellifluously flowing lines to showcase a fluidic theme, instead it's all hard kinks and corners captioning a more edgy design theme. The cut of the air-con vents, the hexagonal-ish housing for the air-con vents and the audio system, the climate control system and even the instrument panel behind the steering wheel are all superbly detailed and styled. 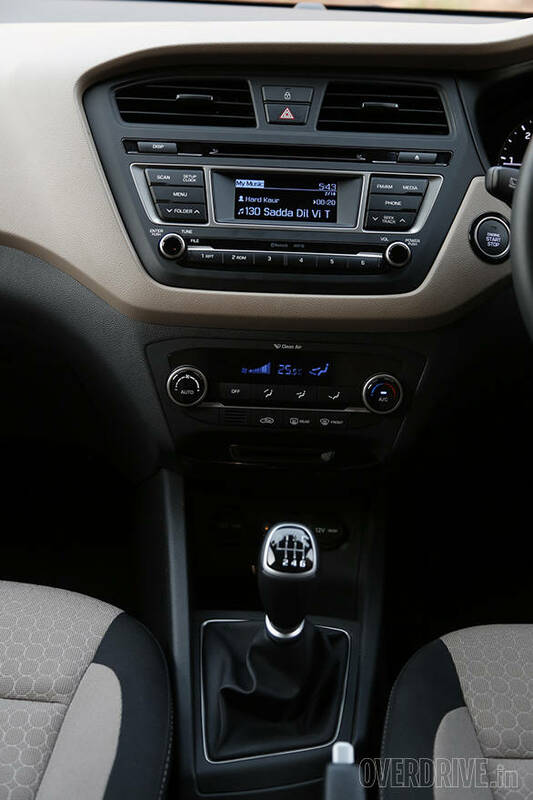 It's a very intuitive cabin and very easily you begin to memorise just where your fingers need to reach, to make audio changes or change the interior climate. More than just the way everything inside this cabin is styled I believe people will be taken aback just as I was with the attention to detail and the way things function. This is a fabulous form and function kind of cabin. Take for instance the controls for audio and the multi information display on the steering wheel. The buttons and knobs are soft touch and require minimal effort to operate. They are also smartly placed, all audio and phone controls on one side of the wheel and MFD on the other. I do feel though Hyundai should have given this cabin a full black tone rather than the dull dark beige mixed with black tones. It brings out the plasticky-ness of the err. . . plastics. Otherwise fit and finish is impeccable and can easily set new benchmarks for the segment. And lest I forget, I also loved the small piano finished bezel around the ORVM control button. The multi function display clearly shows the global reach of this car. 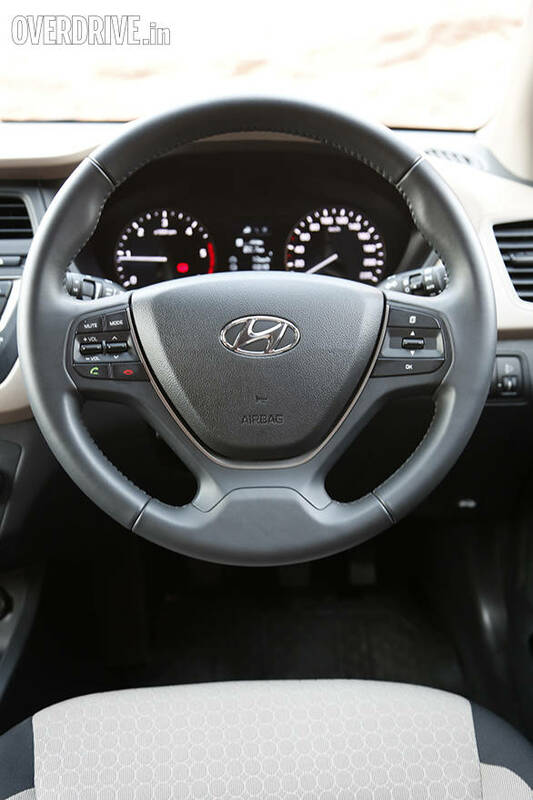 There is a host of information displayed in it, especially multi region units for speed and temperature which clearly indicate that Hyundai have fabricated this as a single unit for a universal market. 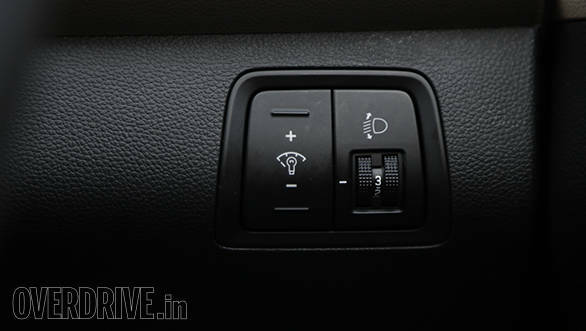 The most interesting feature in this MFD is the one which tells you if the steering is centred or locked into one side. So if you have backed up into your parking while having forgotten to straighten out the wheel and come back to start the car in the morning, the MFD will indicate that your wheels need to be straightened out before you ignite the engine and roll out, probably straight out onto your driveway rather than a wall. I also liked the reminder feature which allows you to set the reminder for your service intervals, either as in number of days or kilometres to go before the next service. Now if only Hyundai had to put in a fuel log feature in it, it would seriously rock. 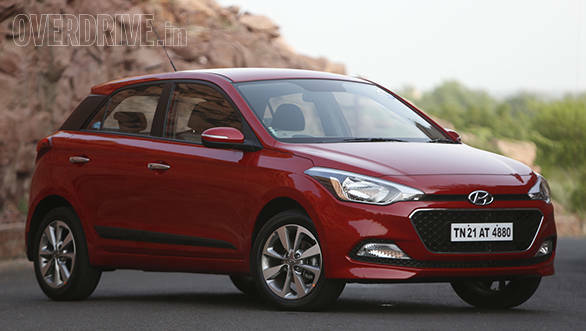 Hyundai have increased the wheelbase of the i20 compared to that of the previous generation car without increasing the length which has in fact decreased by some 10mm compared to the previous generation car. So the i20 stays under the 4-meter umbrella yet is able to redefine how the interior space needed to be managed. So essentially what you get is a more spacious cabin in terms of knee room and thanks to a slight widening of the body, you also get better shoulder room. Height adjustable seats for the driver means you also get the headroom you want though at the rear taller people will feel a bit claustrophobic because of the sloping roofline. The seats are supportive and on a short drive I felt it had enough strength to keep your back and thighs firmly in place. There is no armrest for the rear passengers diluting the luxury angle this car wants to play to, but you do get a rear air-con vent similar to the Grand i10. It's also got a flat floor which means a third passenger can fit in comfortably though there is no headrest for that middle seat. 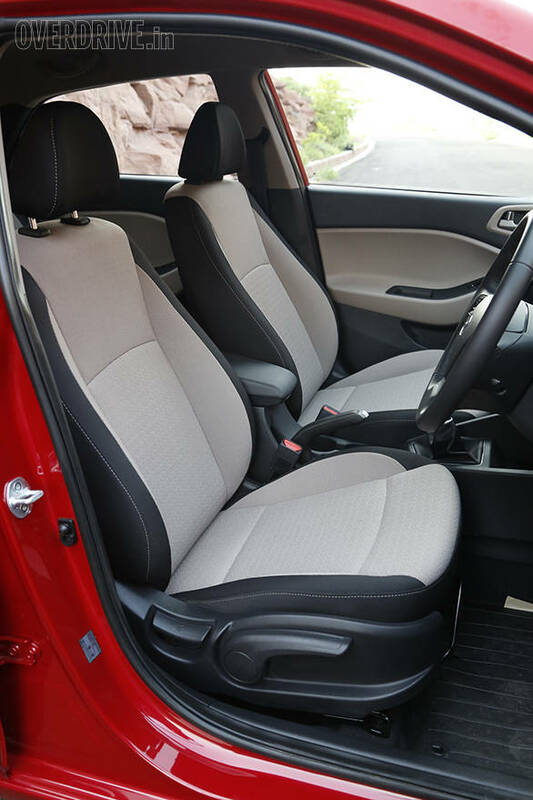 There are also enough cubby hole storage areas as well as cup and bottle holders for you to keep things well organised inside the i20. The glovebox is a cooled area and the sunglasses holder is large enough for you to stash a can of Red Bull in it if needed. 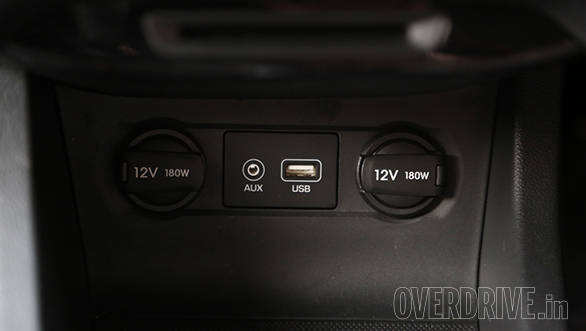 I did like the twin charging points in the front, alongside the AUX and USB connectivity points. This means more than two people can now simultaneously charge their electronic devices. You also get Bluetooth connectivity to hook up your phone and playback music. Six speakers give out reasonably good audio quality though I think it's time Hyundai did pay a bit more attention to this area. The instrument panel has a white backlit effect which can be dimmed and brightened by a knob next to the headlamp adjuster but interestingly the blue backlight for the rest of the controls on the dashboard and even the display for the audio system can't be dimmed and that can be a sight too distracting after dark. 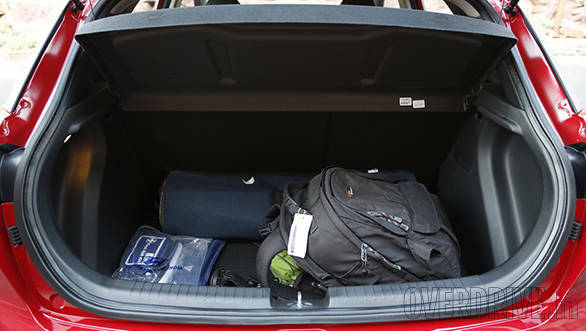 The boot is immense and space can be increased thanks to a 60:40 seat split. It's not very deep but has the width for you to place large bags comfortably within. The new i20 gets the same petrol and diesel powertrain configurations as before though minor tweaks for efficiency and better load management have been employed. I have driven the 1.4-litre 16-valve 4-cylinder CRDI. You get 90PS at 4,000rpm with a superb 222Nm of max torque between 1,500 - 2,750rpm from this engine. Max engine rpm cuts off at 4,750rpm. The power and torque ratings in the new i20 diesel are adequate for every situation though I do feel Hyundai should have tuned it for better bottom end characteristics. The turbocharger kicks in at 1,400rpm and the boost improves acceleration past that point however, under that mark it feels a bit sluggish. 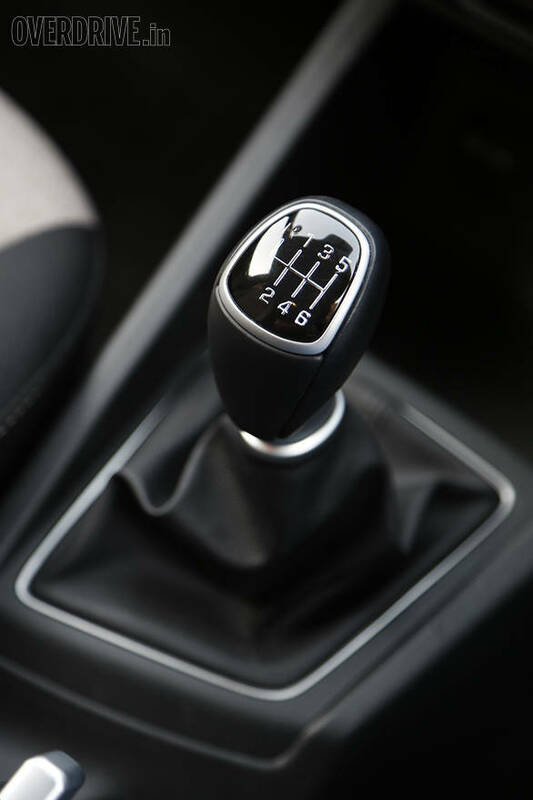 Dense traffic as a result will see you shifting through first and second gears constantly, moreover since it comes coupled to a 6-speed manual transmission which is a fuel efficiency enhancer. Hyundai claims an ARAI certified fuel efficiency of 22kmpl for the diesel, with 19kmpl for the petrol. Interestingly the petrol engine gets a 5-speed manual. There is no automatic at the time of launch but expect one in the future. The diesel engine then, as I mentioned, has got a strong mid-range and you only feel the punch once the turbo kicks in. Acceleration after that is brisk and makes this an effortless highway cruiser. Though having said that it's no slouch in city traffic either, the responses are sharp and you can get going pretty quickly when the need arises to get past slower moving traffic in urban areas. The diesel is also superbly refined and thanks to immense sound deadening, there is barely any engine clatter audible inside the cabin. The highlight of this drivetrain though is the slick shift lever which has short precise throws. I do like the way you can just give it a light nudge to slot into the required gear. Reverse gear on this can be found in the same place as first gear but engaging it requires you to raise the lever and then slot it into reverse. It's a safer move unlike what you get in the VW Polo. The ride quality is good for most urban and highway conditions. The MacPherson setup at the front with a torsion beam axle and coil springs at the rear are adequate dampers for good and bad roads. Large potholes can be a bit unsettling, resulting in sharp thuds but overall the ride quality is comfortable. On the handling front, I do feel that the new i20 is seriously underpowered for the kind of control it exhibits. It's tightly controlled in corners and while there is some body roll, it's not unsettling nor does it at any point make you feel unsafe. I did find the steering a bit elasticky and it's not as impressive as in the Grand i10 but it's light enough for urban commutes with enough weight for when you take it out of the city. 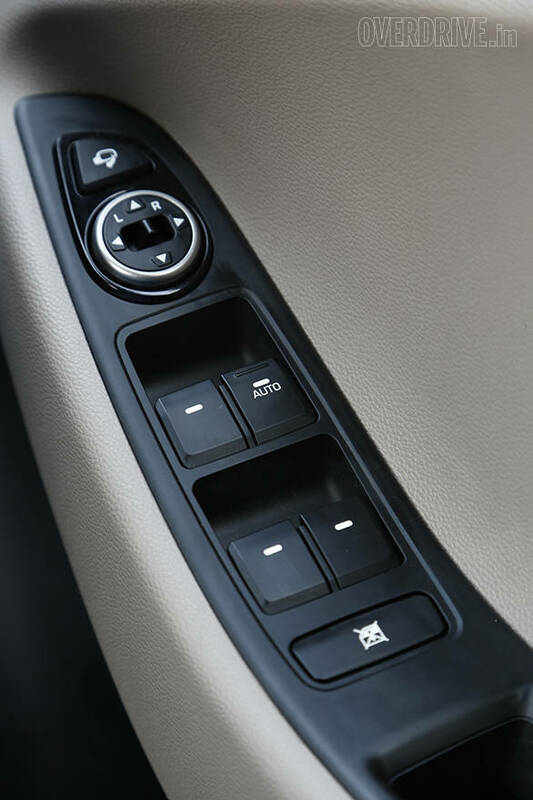 The assistance fortunately is not excessive and like in the Verna or the previous i20, you do not need to be extra cautious when taking the steering wheel off centre. 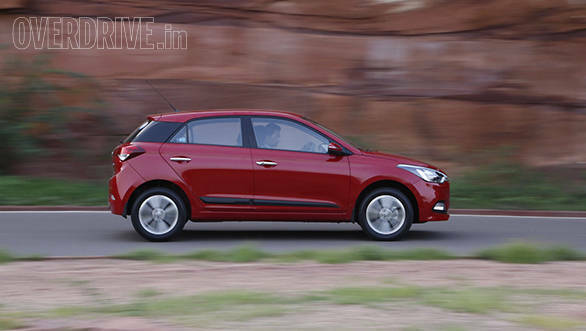 Compared to the diesel variant, the petrol i20?s steering setup feels lighter, thanks to the lesser weight of the petrol engine. But that also makes the steering feel more lifeless. The engine however, feels livelier than its diesel counterpart. Being a naturally aspirated mill, it has a more linear power delivery with no flat spots to complain about. 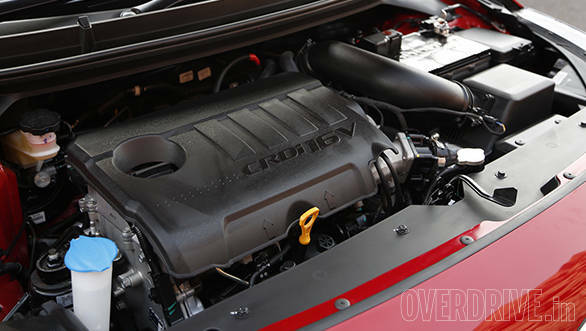 The engine is rev happy and gets the car rolling from as low as 1,200 rpm. Needless to say, it is also quicker and more refined than its diesel sibling. I quite easily see the potential this car has to be an incredible handler and I do think the European spec version with its larger and broader tyres and more power combination will be an absolute scorcher. For Indian conditions the i20 is a smooth, luxurious commuter with refined highway manners that are definitely a much bigger improvement on the car it replaces. Hyundai definitely have a finger on the pulse of the Indian buyer, they very effectively know just what it is the market demands and are responding with highly emotional products. 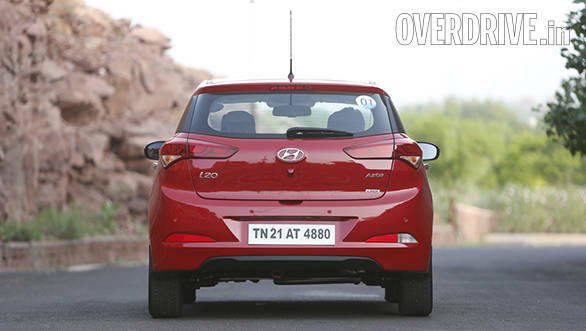 The only emotions they aren't touching are the ones that enthusiasts bear, so if you are looking for a hot hatch and the i20 definitely looks the part, this is not the car for you. If you want a smooth effortless and feature rich product then the i20 ticks all the right boxes. I am impressed but only so much, I want the European spec with more power and better dynamics but that's me. For the general populace, this is a superb car though I do feel Hyundai should have priced the higher variants a bit more competitively. They would have taken a hit but would have gotten an immensely stronger customer base. Superbly finished, good looking with a great drivetrain and refinement, a list of features to put the competition to shame, the i20 can go on to achieve great things for Hyundai. It's definitely an evolutionary product and one that will either take the competition back to the drawing board or offering massive discounts. Either way, it's something that will earn you your neighbour's envy for a long time to come!